Skyblock just updated to Minecraft 1.7.2. So update your clients to be able to connect. Right now we’re in testing mode, meaning all new items have been disabled. The reason for that is if we find the new version has major bugs, or is derpy in any way we can roll back to 1.6 without affecting players in any way. The new items will be enabled once we’re reasonably sure 1.7 works properly for us. 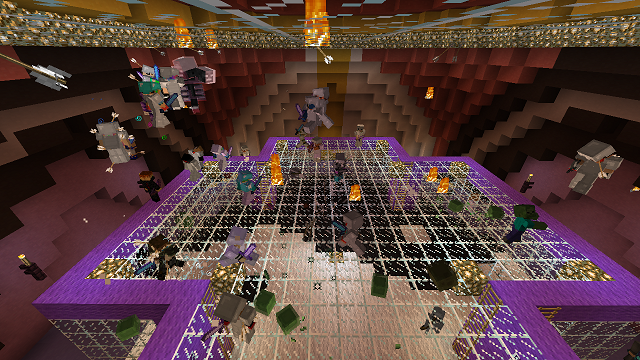 Loads of mobs, loads of fun. Apart from withers, we also had an unannounced bonus: 4 witch spawn eggs. Congratulations to everyone! Later today I’ll announce the second anniversary kit, so keep checking our website or better yet in game. Also, went a bit over this in-game last night during the event, we’re going to have a huge raffle this Sunday with real money prizes to end the server celebration week. You’ll be able to pick any items or upgrades from the real money shop totaling up to whatever amount you win. First prize – $45, second prize – $30 and 3rd prize – $15. This entry was posted in Minecraft Skyblock Server News, Minecraft Survival Games News on November 22, 2013 by heatseeker0. Yes of course. The idea is you have however much you win to spend towards items and upgrades. It doesn’t have to be a single item, it can be as many as you want but the total value should not be more than what you won.